UC Irvine Medical Center has nominated Amelia Indig, RN, as a Hospital Hero for her commitment to patients and her leadership of a team that revamped the hospital’s preparedness to successfully handle obstetrical emergencies. Each year, the Hospital Association of Southern California invites medical centers to nominate a Hospital Hero to honor health care professionals that go above and beyond the normal call of duty to improve care for patients. The association will recognize Indig and other Hospital Hero nominees at a luncheon on Nov. 11. As a nurse in UC Irvine’s High-Risk Maternal-Fetal Program, Indig knows that obstetrical hemorrhaging is a leading cause of maternal death related to childbirth. She set out to find ways to improve the medical center’s readiness to handle bleeding that could cause seemingly routine pregnancies and deliveries to turn critical in minutes. Under protocols she initiated, maternity patients are assessed daily for hemorrhage risk. If a patient bleeds during her hospital stay, nurses are prepared to respond quickly, says Indig, who has worked at UC Irvine since 1997. A hemorrhage response cart holds all the necessary supplies, so nurses don’t lose time gathering them from different locations. Rapid-response protocols were created with the blood bank, pharmacy and anesthesiology. An obstetrical emergency code immediately summons all necessary medical staffers. “Obstetrical hemorrhaging is a serious problem but it can be treated if caught in time —something that has been made much easier thanks to the passion of Amelia Indig and the collaborative spirit at UC Irvine Medical Center,” says chief operating officer Alice Issai. When Indig met Angie Bloom after her transfer to the UC Irvine Medical Center last fall to deliver identical triplet girls, Bloom and husband Steve had no way of knowing the critical role Amelia’s hemorrhaging protocols would play during the delivery. After carrying the triplets for 34 1/2 weeks, including 10 weeks of bed rest, Bloom was scheduled for a cesarean section in November 2010. Stevie was born first, followed by Lauren and Elise. All were healthy and weighed around 4 pounds. But Steve Bloom saw in the faces of the doctors and nurses that something was wrong. four units, then another eight when the bleeding stopped and started again. More units quickly arrived. Surgeons removed Bloom’s uterus and one ovary, which were involved in the bleeding. With the babies safely in UC Irvine’s neonatal intensive care unit, a team of surgeons, anesthesiologists, interventional radiologists and nurses worked for nearly 12 hours to stop the hemorrhaging. In all, Bloom received 50 units of blood—the equivalent of nearly six people. 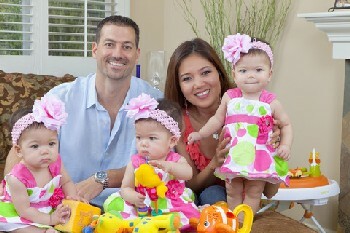 Since then, Angie has slowly recovered and the triplets are thriving. This set of best practices to detect and treat obstetrical hemorrhaging dovetailed with a statewide collaboration focused on this problem.